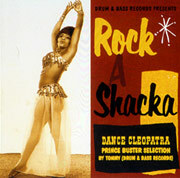 Volume 5 of an 8 CD issue Rock A Shacka series in Japan. Even more unissued material on CD from Prince Buster. 15 tracks from Prince Buster many from the Blue Beat label including 'Dance Cleopatra' from 1967 which is much sort after by collectors. Some great instrumentals '707' which is Peter Gun given the Ska beat and blazing sax solo's. 'Independence 65' uses the talk over DJ technique and crowd cheers to good effect. 'Ali Shuffle'' Trip To Mars' and 'The Hunter' are all good instrumental tracks. The sound quality is what you would expect as most tracks are dubbed from 45's. Licensed from Island records and issued on Rock A Shacka CD UPCH 1261 Japan.